Let’s take a look at the importance of cost per label and production volume when buying a label printer. What most businesses don’t realize is that it’s often ink consumption, not the upfront price, which determines the real cost of any label printer. Depending on the number of labels you need, the cheapest machines can actually be the most costly. Here’s the crucial thing: buying a label printer is not an expense – it’s an investment. Those are very different things. 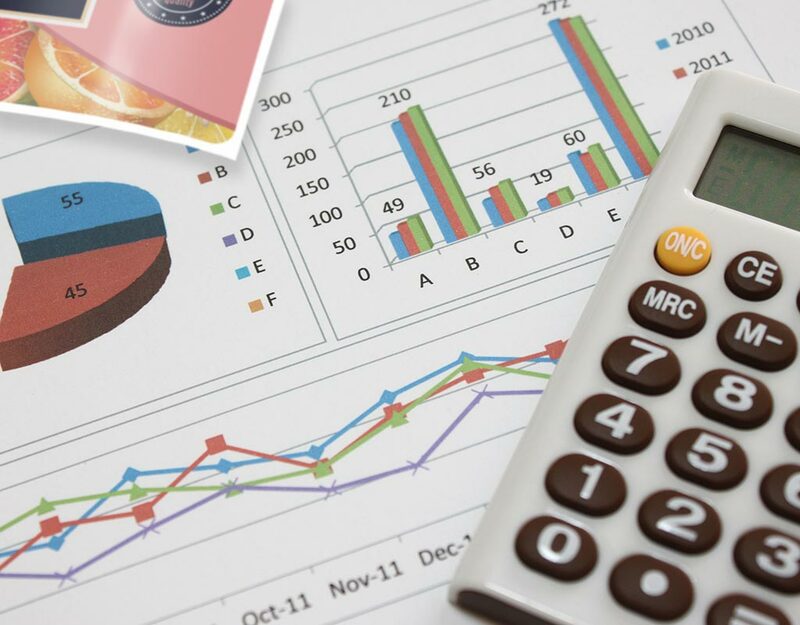 Expenses are necessary evils: they cost money but perform a useful or essential function within the business. Investments also have an upfront cost. The difference is that over the long-term, investments will directly benefit the business. This is often through increasing margins, saving costs, or improving efficiencies within the company. In the case of a high-quality label printer, it’s all of the above. The problem is that we’re used to dealing with upfront costs. If we see a bag of apples for $10, and very similar apples for only $6, most of us will buy the $6 apples. There’s no strategy or long-term consideration, it’s just price vs perceived value. If you’re thinking of buying a new label printer, it’s important to factor in the long-term cost. The price of the machine is important, but it’s the cost per label which matters most. The cost per label depends on the cost of ink required for each design. This is your biggest consumable as a printer owner. 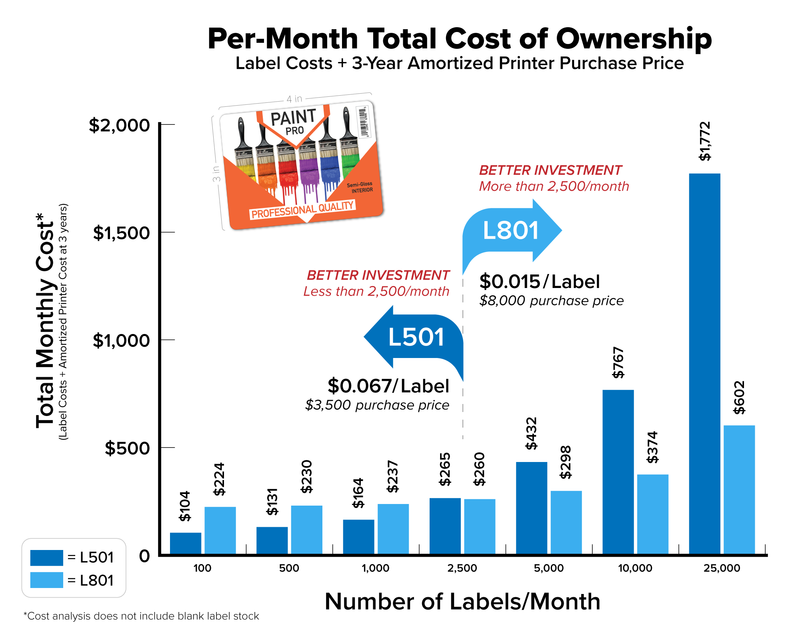 Depending on your printer’s ink cost, that cost-per-year number can vary wildly. If your volumes are high enough, a cheaper printer can use so much ink that, over time, it costs you more than a higher-priced machine. Let’s say a company produces 5,000 labels per month and the current lower-end printer that they use costs 6.7¢ of ink per label. The printer might seem ‘cheaper’ at a cost of $3,500, but given their volumes, the label cost per year would be another $4,000. After 3 years, the investment is $15,500. Imagine the same company instead invests $8,000 in a higher-quality printer, which only uses 1.5¢ of ink per print. Their label cost per year drops to $900, and in just over one year that ‘more expensive’ system has paid for the difference. After 3 years, the total spend is $10,700 – a saving of five thousand bucks! It’s all about striking a balance. Consider the chart above. If your business produces (and will keep producing) less than 2,500 labels per month, then the $3,500 machine is a better investment. In our previous example of 5,000 prints per month, the more expensive machine was the significantly better investment over time. As a rule of thumb, larger ink tanks means higher machine cost but lower costs per label. The trick is to gather all the information you can on potential printers and then repeat our math above to find your sweet spot. There can be a fair bit of guesswork involved—especially if you’re growing or planning to hit new markets—but the results can be enlightening. To better understand your per-label costs, or to speak to a printing specialist and discuss your labeling options, simply get in touch with our team and we’ll answer all your questions!